A leading manufacturer of complex tools and dies for the packaging sector is now making an impression on the label industry. Arden Engraving – part of the Arden Group – has supplied embossing and hot foiling stamping tools to the carton industry for two decades. Now the company has expanded into the label market – offering advanced rotary and flatbed tooling solutions to some of the largest label manufacturers in the world. Simon Lynch, Operations and Sales Director at Arden Engraving, said: “With 20 years’ experience providing high quality embossing and foil stamping tooling to the carton industry, it’s been a very natural progression for us to expand into the label market. “In recent years there’s been a real surge in demand for embossing and foiling on packaging and labels within the food and drinks industries, who recognise that this level of embellishment can add a sense of elevated quality and luxury to a brand. “However, with the number of rotary die manufacturers in the UK being limited, we are delighted to enter this bespoke market to offer a collaborative and innovative alternative to the label industry’s converters. 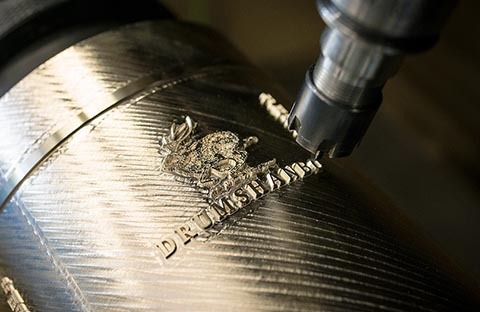 Arden Engraving operates from three sites across the world with its head office in Greater Manchester as well as two further sites in Germany and America. With 20 state-of-the-art CNC engraving machines, a team of highly skilled CAD engineers, and the latest 3D technology and laser technology, Arden Engraving is already working with some of the largest global producers in both the label and packaging sectors. To find out more email orders@ardenengraving.com. Arden Engraving is making an impression on the label sector.